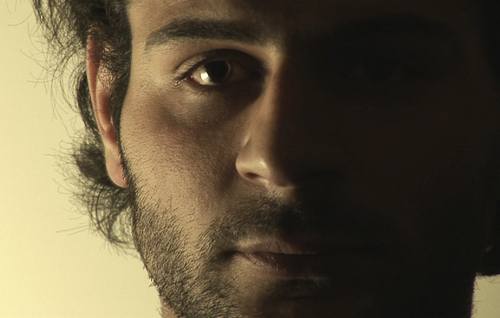 (Courtesy Sundance Institute) An anonymous actor, part of the Aboundaddara Collective in Syria, is featured in the short film "Of God and Dogs," which was given the Short Film Grand Jury Prize at the 2014 Sundance Film Festival. A drama from Syria has won the top prize for short films at the 2014 Sundance Film Festival. "Of God and Dogs," made by the Abounaddara Collective, took the Short Film Grand Jury Prize, at an awards ceremony Tuesday night in Park City. The film tells of a free Syrian soldier who confesses to killing a man he knew was innocent  and vowing to take vengeance on the God who led him to commit that murder. • U.S. Fiction: "Gregory Go Boom," directed and written by Janicza Bravo. • International Fiction: "The Cut" (Canada), written and directed by Geneviève Dulude-Decelles. • Nonfiction: "I Think This Is the Closest to How the Footage Looked" (Israel), directed by Yuval Hameiri and Michal Vaknin. • Animation: "Yearbook" (U.S.), directed by Bernardo Britto. • Special Jury Award for "Unique Vision": "Rat Pack Rat" (U.S.), written and directed by Todd Rohal. • Special Jury Award for Nonfiction: "Love, Love, Love" (Russia), directed by Sandhya Daisy Sundaram. • Special Jury Award for "Direction and Ensemble Acting": "Burger" (U.K./Norway), directed and written by Magnus Monk.